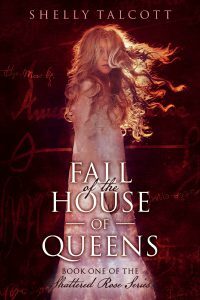 Fall of the House of Queens is a newly released piece of fiction by author, Shelly Talcott about the court of Henry VIII and the king’s relationship with his six queens. The story is written in the first person through the eyes of the King’s fool, William Somers. The only other book I have read written from the perspective of Somers was, The Autobiography of Henry VIII by Margaret George. Who was William Somers? Somers was a fool at Henry VIII’s court from June 1535 and remained in the service of Edward VI and Mary I and died early in Elizabeth I’s reign, on 15 June 1560. When Chapuys referred to ‘the Queen and Princess’ he is talking about Katherine of Aragon and her daughter, Mary. The concubine is, of course, Anne Boleyn. In this book I was surprised that Will was actually a friend of Queen Anne Boleyn and was able to visit his brother-in-law, Sir William Kingston (yes, in this book he is) and convince him to get him a secret meeting with the ill-fated queen who he grew to love after the removal of Katherine of Aragon. Somers appears to have liked each of Henry’s queens, except for Jane. He both despised and feared Jane. Jane Seymour’s charecter in this story was unlike any portrayal of her that I have ever read. While Anne Boleyn had been accused of witch craft it was actually Jane who was practicing the dark arts and had darkness in her soul. This new outlook on Jane was refreshing as she’s always shown as the innocent girl who was forced into the king’s arms. If you prefer to read only non-fiction books on this dynasty I will tell you now that this book is not for you. While the historical liberties taken at first bothered me I quickly got over it by the superb storytelling of Talcott. Talcott is upfront about this saying that she played fast and loose with some historical dates and events in interest of telling a good story. If you are well- versed in the subject they will stand out rather quickly. I saw it as a test of my knowledge. However, if you are new to the subject please feel free to peruse my website to find the real story. I would rate this book 5 out of 5 stars. If you’re interested in this book you can find it on Amazon.com. ..click image below.